All residential properties with shared walls or floors whether formed through ‘material change of use’ (i.e. 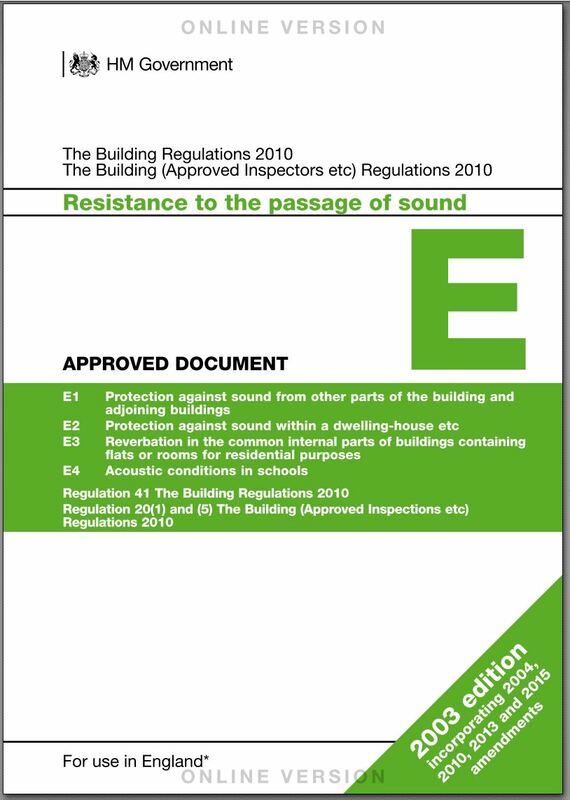 conversion of type of building to residential) or new build must conform to The Building Regulations 2010 Approved Document E ‘Resistance to The Passage of Sound’ 2003 (amended 2004) [ADE]. A major part of ADE is that 1 in 10 dwellings require testing to demonstrate that separating constructions meet the required standard of sound insulation. The regulations go further to state: ‘…Test bodies conducting testing should be preferably have UKAS accreditation (or European equivalent) for field measurements. The DCLG regards members of the ANC Registration Scheme as suitably qualified to carry out pre-completion testing.’ All acting Environoise consultants are accredited to do tests under the ANC accreditation scheme. So you can be confident that sound insulation tests are done by a company whose testing, assessment and reporting is audited. Consequently, Building Control should automatically accept our test reports and results. For BREEAM credits where enhanced sound insulation is required, the testing body, such as Environoise, will need to be part of an accredited scheme. We advise on the façade design of residential developments and review noise levels in garden and balcony areas so that the amenity of residents is protected. As part of our comprehensive acoustic commissioning package, we also check that internal noise levels are suitably low and meet standards. An acceptable standard may be BS8233 or the requirement may be from a Local Authority or guidance from the World Health Organisation (WHO). We consider purge ventilation under Part F of The Building Regulations. Other ventilation strategies are explored whilst meeting noise targets using the recently released ANC Acoustics, Ventilation and Overheating Guidance. Noise from services in mechanically ventilated buildings should not just improve the air quality and temperature in the space but also provide low level noise masking. Importantly, noise from mechanical services should not cause a disturbance, achieved by setting CIBSE based design targets. Our commissioning service includes measurement and reporting of building services noise whether from background ventilation or comfort cooling. For good room acoustics rooms such as classrooms, offices, conference centres, cinemas, theatres and auditoria require a specific reverberation target, we advise on how such targets can be achieved for overall reverberation levels or targeted octave band performance. We can commission the building once surface finishes are installed.